High Back Leather Executive Chair by Boss [B7301] Free Shipping! 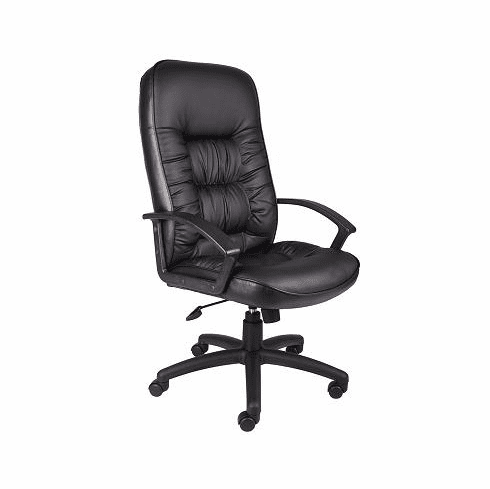 This high back executive chair from Boss Office Products features LeatherPlus upholstery. LeatherPlus is leather that is polyurethane infused for added softness and durability. Other features include executive high back styling with extra lumbar support and integrated headrest pillow area, extra thick seat and back cushion, pneumatic gas lift that provides instant seat height adjustment, adjustable tilt tension that assures the right reclining tension, upright locking control, durable polypropylene armrests and solid five star nylon base with hooded double wheel casters. Matching sled base guest chair available. Other options include a durable chrome base for a minimal upcharge. Dimensions: Back: 32"H x 21"W. Seat: 20"D x 20.5"W. Seat height: 18" to 21"H. These Boss leather executive chairs normally ship within 2-3 business days from our GA or CA warehouse.